WP Popup Banners – is a FREE WordPress plugin by AccessPress Themes which allows you to create multiple pop-up banners for your website. You can create an image or text banners, define individual settings for each banner and have the banner popup on your website or specific pages of the website. Besides, you can enable/disable the banners as per your need! 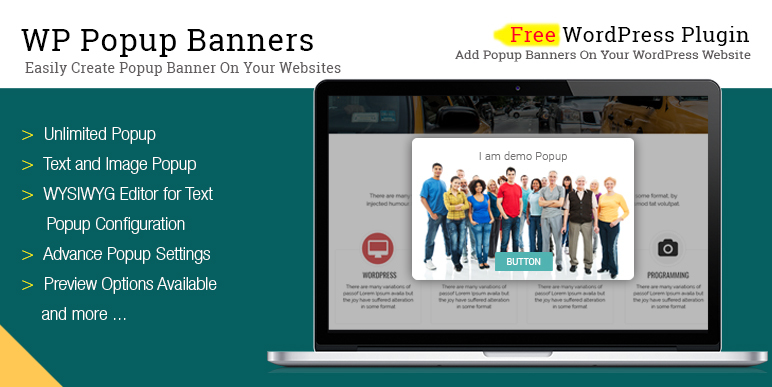 Hey Buddy!, I found this information for you: "Free WordPress Popup Banners Plugin – WP Popup Banners". Here is the website link: https://access-keys.com/wordpress-plugins/wp-popup-banners/. Thank you.